Byrdcliffe’s wonderful annual Winter Solstice tradition continued this holiday season with a performance by Happy Traum & Friends on Saturday, December 13, 2014, 8:00 pm at the Bearsville Theater in Woodstock. This year’s line-up included John Sebastian, Amy Helm, Paul Rishell and Annie Raines, Mike + Ruthy, Byron Isaacs, Eugene Ruffolo, Ben Vita, and April Traum. Proceeds of the event support the ongoing work of Byrdcliffe as a center for the arts and a community for artists in the Hudson Valley. The Woodstock Byrdcliffe Guild presented: Byrdcliffe Night at the Opera – a gala evening that started with a scrumptious dinner at 5:30 pm at a Byrdcliffe board members’s home, followed by a lively night of music at the Byrdcliffe Theater at 8:00 pm with Maria Todaro and Louis Otey, founders of the Phoenicia International Festival of the Voice. The program included duets and arias by Handel, Mozart, Rossini, Verdi and Vivaldi. Following the performance there were an auction and a champagne and dessert reception. Opera attire, however you interpreted that, was strongly suggested. We were happy to see close to 100 people for a festive evening of song and celebration. Back by popular demand, world class jazz trombonist Roswell Rudd performed at the Kleinert/James Center for the Arts on Saturday, July 26. Rudd’s performance packed the house again this year. The July 26 concert marked the world premiere of Rudd’s Kerhonkson Trio, neighbors and musical explorers, consisting in addition to Rudd of Heather Masse, vocals, and Rolf Sturm, guitar. Read an article about Roswell Rudd and his performance at the Kleinert/James in the July Chronogram issue! 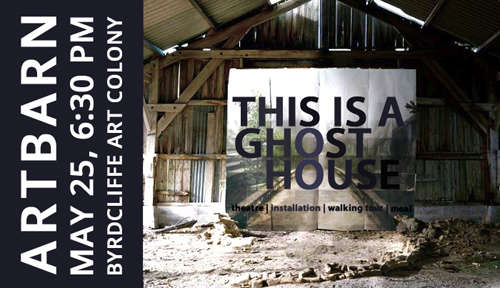 Tickets: $20 general admission / $18 for Byrdcliffe members! On Friday, June 6, the Woodstock Byrdcliffe Guild presented an evening of classical vocals in its Kleinert/James Center for the Arts, in the heart of Woodstock. This lush performance included rarely heard duets by Robert Schumann (1810-1856) for soprano and alto with piano accompaniment, as well as a selection of duets from the operas: The Coronation of Poppea by Claudio Monteverdi, The Marriage of Figaro by Wolfgang Amadeus Mozart, and Der Rosenkavalier by Richard Strauss. Images on left and right: Video stills from Linda Loves Bob, Ione’s Dream Festival, 2008, Alternative Book Store, Kingston, NY; Video Editing: Tobe Carey; Camera: Diane Teramana // Photo of Montano in the middle, courtesy of Annie Sprinkle. All 2014 Byrdcliffe arts programming is made possible by the New York State Council on the Arts with the support of Governor Andrew Cuomo and the New York State Legislature.